This book bears some of the marks of Steve Hanson’s past participations in materialist psychogeography; but his immersion is now ethnographic as he turns a meandering engagement with his home town of Todmorden (UK), on the border of Lancashire and Yorkshire, into a full scale study. Despite the familiarity, there is no complacency. The opposite; for Hanson fears “immersion in time and place does not necessarily mean knowing”. He is well aware that the smudging of “fuzzy borders” around identities and properties, in the disarticulations of globalisation and then recession, extends to his own attempts at a radical methodology. 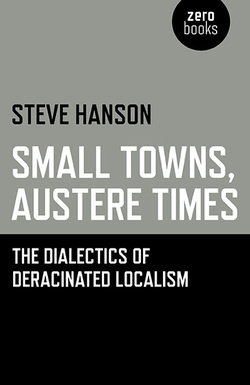 Oddly, but grippingly, Hanson finds his way into the story of contemporary Todmorden through the figure of a local neo-Nazi, as this conflicted individual “attempts to re-localise – mentally – into smaller and smaller borders, this country, this county, this town, and then eventually to his own remote farm where he is.... underpinned by the unfettered circulation of fascist rhetoric”. Small Towns, Austere Times is peppered with such contradictions; as much at work in the neoliberal organising, shrinking localism and savvy media-promotion of ‘local food’ initiatives by benevolent liberals as in the tortured “all-over-place” thinking of the narrow-minded bigot. Away from the I-catching activists, Hanson vividly depicts more common and anonymous experiences of a despairing “nowt to do”, streets at times deserted, the “micro-universes next door which never really meet”, the colonial and neoclassical iconographies of the park, a depth that becomes complex surfaces, a pirate (both bitter and relaxed) of dvds on his sales-rounds about the pubs, and the ironies of a fake pub inside a private house and of property contradictions in the ‘anarchist house’. To make sense of, let alone find a way through, the despairs, sudden angers at the ‘workshy’ and barely getting-throughs, Hanson insists that we must abandon binaries for dialectical seeing. He senses that history may be “opening again”, but is suspicious that if people are really ‘waking up’ from the illusions of the bubble years it may only be in order to enter “other, perhaps older dreams”. His proposed instrument for shaping a resolute response is negative dialectics; stepping back from false totalities, he picks over shattered subjects, remnants and ruins of old labours, fractured lives and jagged relationships, musing whether “the only methodological unit left to us is the trace” and places them before us for very close attention, quoting Adorno’s aphorism: that the “splinter in your eye is the best magnifying-glass”. Hanson’s disturbance is not at worlds of fragmentation, the simultaneous slipping and tightening of borders, the narrowing and homogenisation of liberal localism and the paranoia of neo-fascism, but by what they do collectively to thinking, fearing that he himself is in danger of taking a “path away from what is and into my own inner landscape”. And here lies part of Hanson’s problem; nervous about “dreams”, particular old ones, his splintered materialism has yet to help him identify a motor that might help to, or simply do the business of, connecting fragments despite miserable hatred, tepid affect and a posture of alienated ambivalence. The contradictions he describes are striking and delineated in moving detail and compassion; but they are un-dynamic; which is not to say that a revolutionary negation may not emerge in his future studies within the circulation of fragments and commodities, but without “dreams”, even old ones, how will he ever intuit the tension between, on the one hand, the heroic fantasies and sensorial nightmares for sale on burned dvds in the pub and, on the other, the “nowt to do” of late-late-capitalism’s over-connected disconnectedness; shrapnel splinters without explosions.